When you choose HairPalace for your hair transplant surgery, you’ll travel to Budapest, Hungary for the cost-effective hair tranplant procedure itself. We’ll provide you with a premium apartment to relax in before and after your treatment, and you’ll have plenty of free time to explore this beautiful city. There’s a wealth of places to visit, restaurants to dine in and views to take in — but what are the top attractions for sightseeing during your time in Budapest? 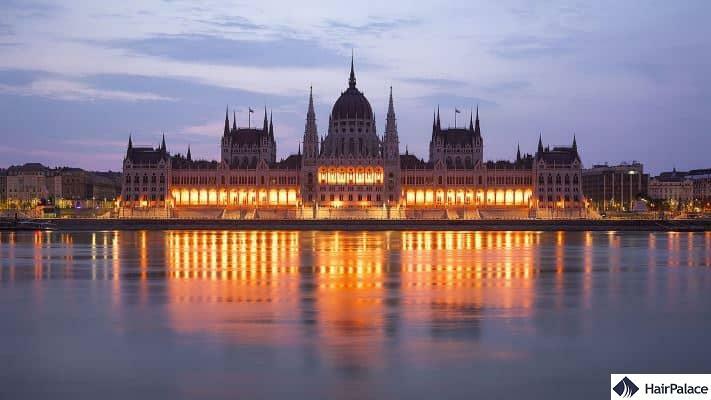 Budapest’s beautiful Parliament Building is a striking sight everyone must see when exploring Hungary’s capital. This incredible structure is spread across more than 193,000 square meters, stands over 315 feet tall and boasts in excess of 690 rooms. The Neo-Gothic architecture is breathtaking, adorned with 90 statutes that add real character to the exterior. Construction on the Budapest Parliament Building finished in 1902, almost thirty years after it began in 1885. It’s a remarkable achievement the city should be proud of. If you wish to visit the Parliament Building and take a look inside, you can sign up for guided tours (usually lasting around 45 minutes). These afford you a close-up view of the House of Lords, the entrance hall, one of its lobbies and the Hungarian Crown Jewels too (a real highlight). However, these are available only when the government isn’t sitting, so make sure to confirm when access is available to avoid disappointment. The Hungarian Crown Jewels are an essential part of visiting the Parliament Building, given their beauty and rich history. They were moved to Western Europe following the Second World War to protect them from the Soviet Union, and were secured at Fort Knox, Kentucky, USA during the Cold War. They finally made their way back to Hungary in 1978. Try to make time to stop by the Parliament Building during your stay in Budapest, even if you only get to see the exterior. You won’t regret it. Buda Castle and Castle Hill are vital to Budapest’s cultural identity. 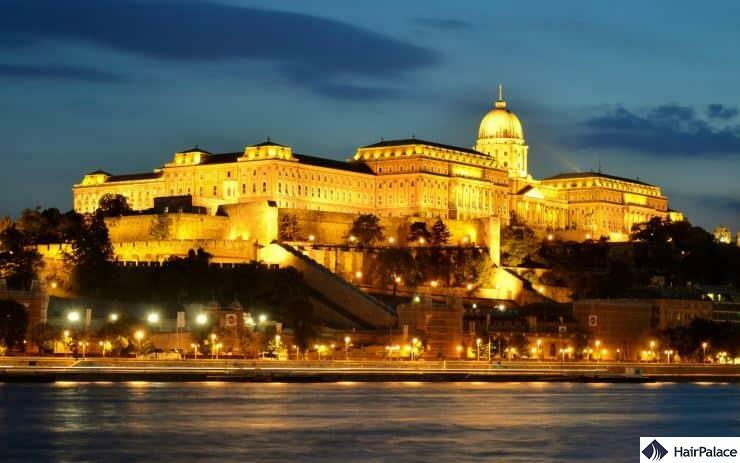 Buda Castle was finished in 1265 originally, but the structure on the site now dates back to the mid-1700s. It’s a huge, powerful sight: the intricate Baroque architecture is pretty awe-inspiring when you first see it. Buda Castle stands on Castle Hill’s southern point, and you can explore both the Hungarian National Gallery and the Budapest History Museum inside it. Want to visit? Take the Castle Funicular Railway to experience a little more of the city’s history. As a World Heritage Site, Castle Hill is home to a wealth of stunning architecture and design, with Baroque structures, cobbled streets and a medieval style that reflects its age. You’ll get an insight into the area’s history through the multitude of informative plaques scattered around. Some of Castle Hill’s most standout spots include Matthias Church and Trinity Square, though there’s lots more to see. Festivals take place in the area throughout the year, and you can stop by the Faust Wine Cellar to try somewhere in the region of 80 different Hungarian wines if you’re a fan. 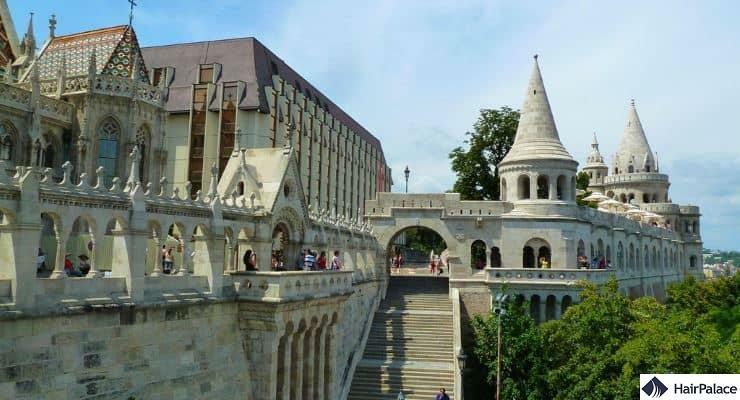 The Fisherman’s Bastion is one of Budapest’s most popular sites, offering some truly spectacular views of the city. Construction started in 1895 and lasted until 1902. It was just one of the projects undertaken to celebrate 1000 years of the country’s capital. The architecture is Neo-Romanesque, featuring seven towers that represent each of the Magyar tribes which settled in the area hundreds of years earlier. A statue of St Stephen (leader of these tribes and Hungary’s first king) riding a horse was built in 1906. This stands in the courtyard today and is well worth seeing. It’s a key part of this fairy-tale-esque setting. The Fisherman’s Bastion is generally said to deliver some of the finest views to be found in Budapest, offering sights of the Parliament Building, Gresham Palace, Margaret Island and more. St. Stephen’s Basilica is Budapest’s third-biggest church. It was first finished in 1905, and stands more than 314 feet tall — making it one of the city’s tallest buildings. 8,000 people can be accommodated in this massive space. Concerts are held regularly in the Basilica, and St. Stephen is buried in the Basilica’s crypt. You can view his right hand (known as the Holy Dexter) if you wish; this is a point of genuine reverence and fascination for many people. The Basilica’s two towers feature six bells, with five in the left tower and just one in the right. The latter is Hungary’s biggest and used only twice per year: once on the 20th of August (St. Stephen’s Day) and midnight of New Year’s Eve. 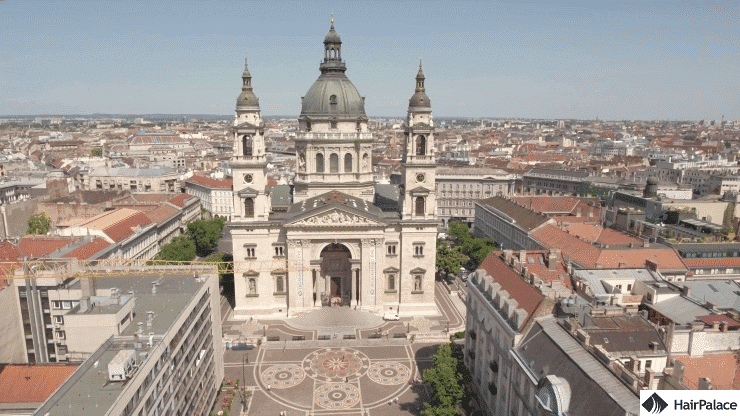 The Basilica is one of Budapest’s most important locations and should be part of any sightseeing tour of the city. 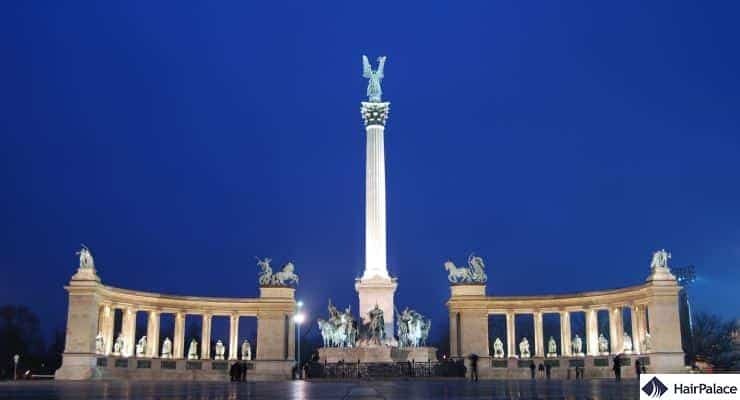 Heroes’ Square includes iconic statues celebrating the Seven Chieftains of the Magyars and Hungary’s other most recognized figures, such as Coloman of Hungary, Charles I, Bela IV and Andrew II. The Tomb of the Unknown Soldier is part of the square too, honouring those soldiers who remain unidentified or unrecovered. Heroes’ Square is located between two remarkable museums: the Hall of Art and the Museum of Fine Arts. If you want to immerse yourself in the country’s culture, Heroes Square allows you to fit in quite a bit of discovery. This site is a major tourist location and is a common spot for big public celebrations and events. The Millennium Monument is in the centre of the square, at the heart of which is the Millennium Column, topped with a statue depicting the Archangel Gabriel. 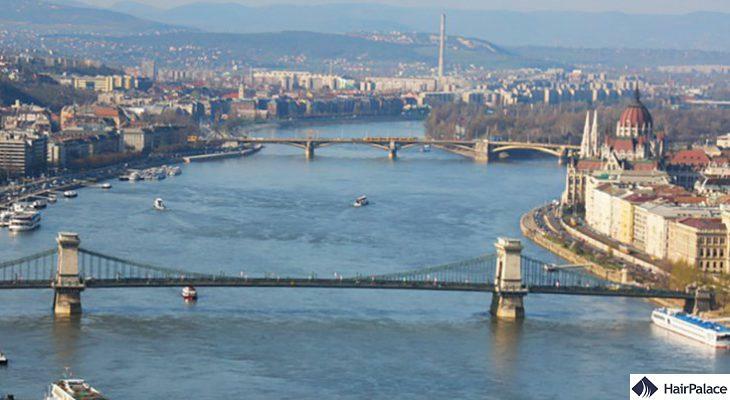 As you can see, there are some incredible things to see in Budapest during your stay. You’ll be able to enjoy downtime before and after your hair transplant surgery, allowing you to visit any or all of the locations covered above. 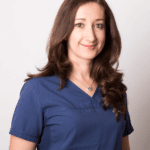 HairPalace’s professional, friendly team has all the information you need on your procedure — if you want to know more, please don’t hesitate to get in touch!